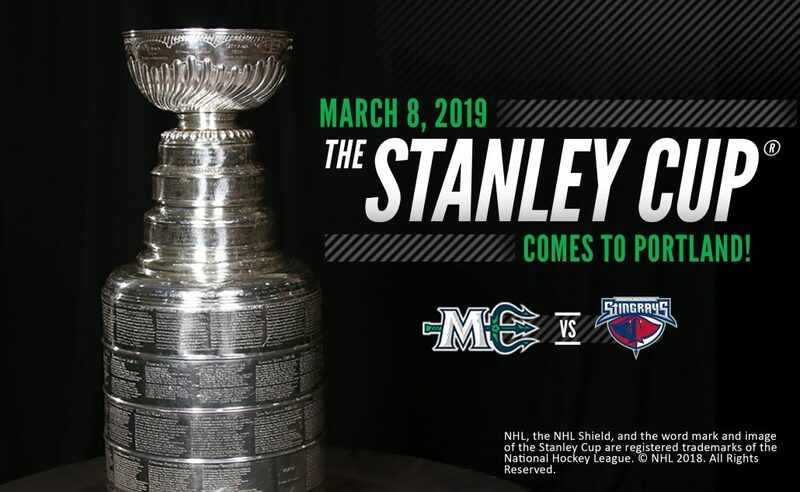 PORTLAND, ME – October 31, 2018 – The Maine Mariners announced on Wednesday that the Stanley Cup®, will be at the Cross Insurance Arena on Friday, March 8th for the game against the South Carolina Stingrays at 7:15 PM. The Stanley Cup will be displayed in the C.N. Brown landing, located in the concourse above the Cross Insurance Entrance of the arena at the corner of Spring and Center Streets. Fans who wish to see or take photos with the Stanley Cup must purchase a ticket to the March 8th game. A Mariners promo team member will be on hand to assist with photos, but fans must bring their own camera or smartphone. No expanded lenses are permitted. One photo per fan will be allowed. Sponsors and those with full or half season ticket memberships will be permitted early access, beginning at 4:30 PM. General admission access will begin at 6:00 PM. The Stanley Cup is the oldest championship trophy in all of professional sports – awarded to the NHL champion since 1926, with roots dating all the way back to 1893. Individual names of each player to win the Stanley Cup are engraved on the trophy. Players from the championship winning team take turns hoisting the Stanley Cup on the ice upon winning the championship each year. The NHL affiliate of the South Carolina Stingrays – the Washington Capitals, are the most recent Stanley Cup champions. Individual tickets can be purchased at MarinersOfMaine.com [DIRECT ONLINE LINK], by visiting the Trusted Choice Box Office inside the Cross Insurance Arena, or by calling the box office at 207-775-3458. To gain early access, half season memberships can be purchased from the Mariners front office at 94 Free Street in Portland or by calling 833-GO-MAINE. The Mariners are home this Friday night, November 2nd, hosting the Reading Royals at 7:30 PM. Tickets are on sale at MarinersOfMaine.com and the Trusted Choice Box Office.